Rangers Ballpark in Arlington is located in the city of Arlington (right between Dallas and Fort Worth), in the great state of Texas. It has gone under a number of names over the years. From 1994 to 2004 it was called The Ballpark in Arlington and from 2004 to 2007 it was known as Ameriquest Field in Arlington. 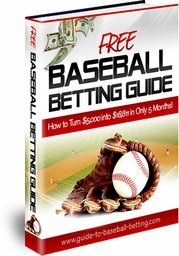 Then in 2007, the Texas Rangers broke their ties with Ameriquest. 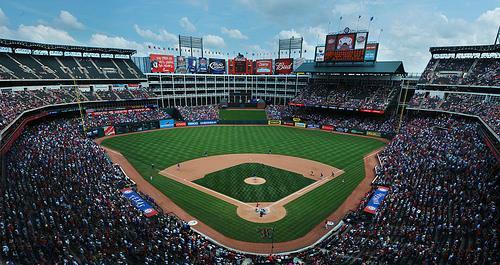 Rangers Ballpark was built to replace the old Arlington Stadium. Not only do the Texas Rangers call this stadium home, but the stadium houses the team's Hall of Fame too. Construction of The Ballpark in Arlington (as it was called at that time) took less than two years to complete. The Texas Rangers played in it for the first time, as far as a regular season game, on April 11, 1994 against the Milwaukee Brewers. The largest turn out of fans was in game 3 of the 2010 World Series on October 30, 2010. A total of 52,419 fans attended this game between the Texas Rangers and the San Francisco Giants. 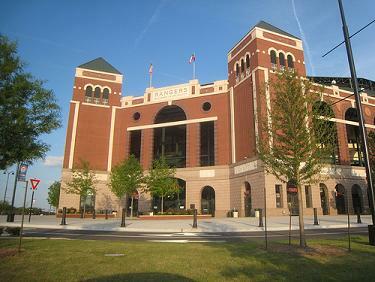 Architect: David M. Schwarz with Architectural Services, Inc., and HKS, Inc.
With Arlington Stadium it became apparent that the Texas Rangers needed a new home. So during the later part of the 1980s they started their push to get one. The Rangers finally reached an agreement in October, 1990 with the City of Arlington for the construction of the new stadium. The city approved funding for construction in 1991. The actual construction started on the 2nd of April in 1992. This new stadium was built not far from the old Arlington Stadium. When "The Ballpark in Arlington" was finished, there was an exhibition game played against the New York Mets and the Texas Rangers on April 1, 1994. The first regular-season game was held on April 11th that year with the Milwaukee Brewers. David M. Schwarz, from Architectural Services located in Washington, D.C., designed this beautiful ballpark. The Rangers wanted a ballpark style of earlier years. So the home run porch out in right field had a roof similar to that of Tiger Stadium. The decorative band surrounding the upper deck was of white steel and was actually copied from Yankee Stadium pre-1973. The stadium also has an out-of-town scoreboard reminiscent of Fenway Park. Rangers Ballpark does have some features all its own as well. There are a number of stone carvings with a Texas feeling to them scattered throughout the ballpark. The center field has an office building with 4 stories, which closes the ballpark in. Since they constructed the stadium in one of the former parking lots of Arlington Stadium, nothing hampered the size the field. To add some nostalgia, they used the bleachers, foul poles and home plate from the old Arlington Stadium. One interesting feature in Rangers Ballpark is the Greene's Hill section. The architects extended the turf beyond the center field fence. It gives the batters some contrast, so the hitters can see the ball better. The grounds keepers used to mow a "T" mowed in it, but they no longer do this. The Rangers originally designed "Greene's Hill" as a picnic area for fans but the Rangers have never used it for this purpose. Completely update the park's audio system with new equipment. Add up-to-date high-definition technology to the left-field scoreboard. Install high-definition video boards in right and center field. Install an IPTV system, which can show HDTV content on the park displays. Install an updated Show-Control System to allow the viewing of networked data like scores, POS information and videos to any point in the ball park. The field dimensions of Rangers Ballpark at Arlington are 332 feet down the left-field line, 400 feet to center field, 325 feet down the right-field line, and 60 feet to the backstop. 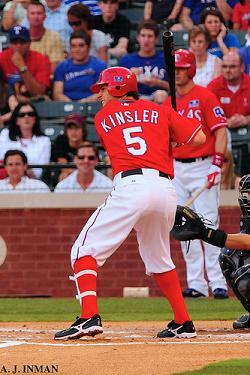 If you're considering going to a Texas Rangers game, Buy and Sell Texas Rangers Tickets Here!